Many people are concerned about how to handle the need for long-term care. Most people think long-term care refers to an insurance product. While insurance may be part of your strategy, it can be cost prohibitive or medically unavailable for some. Long-term care encompasses everything from the services, supports and finances needed, to where you want to live and how you will navigate the maze of financial, legal and personal decisions that you will need to make based on your preferences and circumstances. 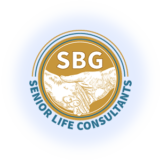 At SBG Senior Life Consultants, we encourage you to begin to think about how you will handle the need for long-term care and we will work hand-in-hand with you and your family to create a plan unique to you, designed to help you achieve your very best quality of life. • Where do you want to receive care? • How will You pay for care? • How much care will You need? • Who will provide your care? • Will your family care for you?